The 2018 ARCA Menards Series season was a character builder for Munford, Alabama’s Bret Holmes (No. 23 Holmes II Excavation Chevrolet). Holmes and his family-owned team started the season competing for the win at Daytona but ended up with the team’s blue Chevrolet on its side sliding down the backstretch coming to the white flag. It turned out to be a metaphor for his entire season. Despite good cars and good effort behind the wheel, Holmes and crew just couldn’t break through and consistently race among the top five. The team sat out every race but one the second half of the season while plans were put in place to regroup. Meanwhile, Holmes slid behind the wheel of Ken Schrader’s No. 52 for three more starts. He would eventually finish the season tenth in points but was already looking for more in 2019. Holmes refocused his efforts and the results have been immediate. Working with crew chief Shane Huffman, Holmes and team were again in contention for the win at Daytona before the same misfortune befell them. Another crash coming to the white flag left Holmes with a finish that belied the team’s performance. Rather than dwell on what could have – or should have – been, Holmes turned his attention to the next race at Five Flags Speedway. A former pro late model champion at Five Flags, Holmes ran up front all evening and finished sixth. The strong finish moved him to third in the series championship standings, just 95 points behind leader Christian Eckes. “I feel like the No. 23 team is in a really good place right now,” said Holmes. “You know it always takes time for a new team to get to know each other, learn how each other works, really gel together, but I think we’re past all that and are working well together. We’ve been working hard on our driver/crew chief communication. Shane (Huffman) and I sat down after Pensacola and talked through some different strategies and what we needed from each other. We’re at a good point moving forward. I know I still have some work on relaying notes and adjustments I need to the team, but I’m confident going into Salem. Holmes comes to Salem Speedway with a strong performance in the last race, and data in the team’s notebooks after a strong test at the legendary southern Indiana oval last week. 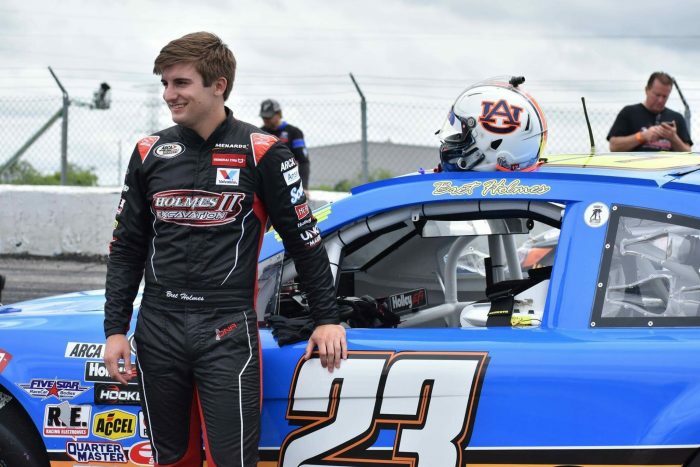 Holmes is a building sciences major at Auburn University, something he takes just as seriously as his racing career. Practice for the Kentuckiana Ford Dealers ARCA 200 is set for 11 am ET on Saturday, April 13 with General Tire Pole Qualifying scheduled for 3 pm ET that afternoon. The green flag on round three of the 2019 ARCA Menards Series season will drop shortly after 2 pm ET on Sunday, April 14. The race will be televised live on MAVTV and ARCA for Me members can access live timing & scoring, live chat, and live track updates at ARCARacing.com. New members can register for free at ARCARacing.com/login.